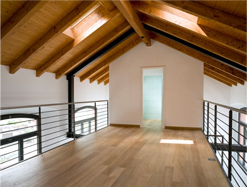 Interloft is a professional and reliable loft conversion company in Harrogate. Specialising in loft, part loft and dormer conversions, we can provide you with an outstanding service, great value price and best of all, practical living space wherever you are in Yorkshire. A loft conversion not only increases the amount of living space in your home, turning into an extra bathroom, bedroom or even an office – it can also increase the value of your property and even create income if you decide to sub-let it. Working with you on the design and functionality to create the perfect loft conversion, our professional team are friendly, reliable and always complete the job to the highest standard. With over 15 years’ experience of loft conversions in Harrogate and a glowing reputation from countless past customers, Interloft is the only company you need for an attic conversion. Whether you want a complete loft conversion, a dormer conversion to maximise space or part loft conversion to reduce the cost, simply give us a call on 01423 298 034. At Interloft we never use sub-contractors, so you can be assured of a fantastic and friendly service every time. All of our loft conversion projects are completed within 6-8 weeks, and disruption to your day-to-day life will be kept to a minimum. With a ten year warranty available and complete project management from concept to completion, you can rest assured that your home is in safe hands with Interloft. So if you’re looking for the best loft conversions in Harrogate, look no further than us! Call 01423 298 034 for a no obligation quote or take a look around our website for more information.